definately has never seen roxy in a picture.... she looks like an old asian hillbilly dog (if we were to assign ethnicity to dogs that is!). this pic from the dog party for Winston and Luke we had on Sunday! There were doggie cupcakes and even scooby-doo doggie goodie bags to take home! 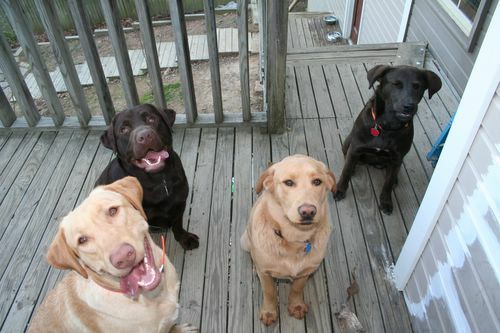 Pictured (L-R): Luke, Winston, Arlo, and Roxy. oh that is like the 12th time i have laughed out LOUD at that pic in 24 hours. oh i love it. in fact all four of them are funny to me. and you going to a doggie bday party is funny to me too. That made me laugh a lot. Then I looked at it again and continued to laugh. Dogs rule! I seriously just laughed in class.. in secured transactions..about your doggie face comment.. I just started the silent laugh mode and then it got bad.. damn you..damn you. lol! katie, that is so cute!! dog parties??!!! awesome!